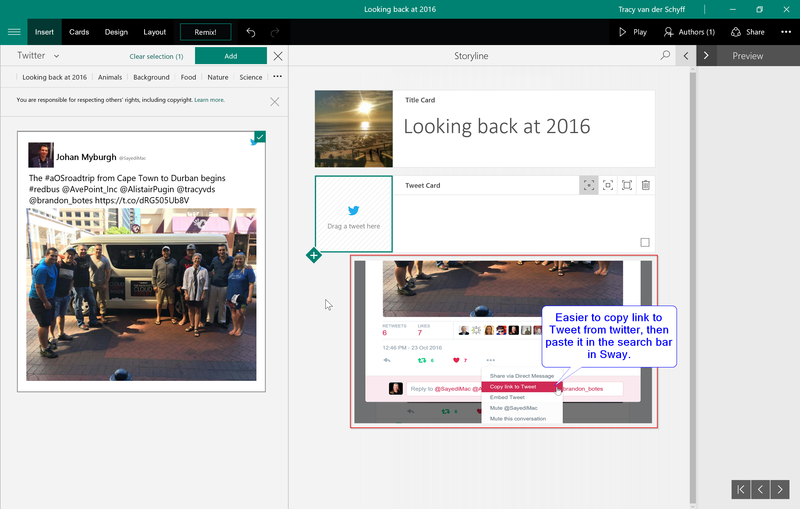 #Office365Challenge Amongst other things, Sway allows us to insert tweets, videos and embed code in our presentations. Let’s see how that works. 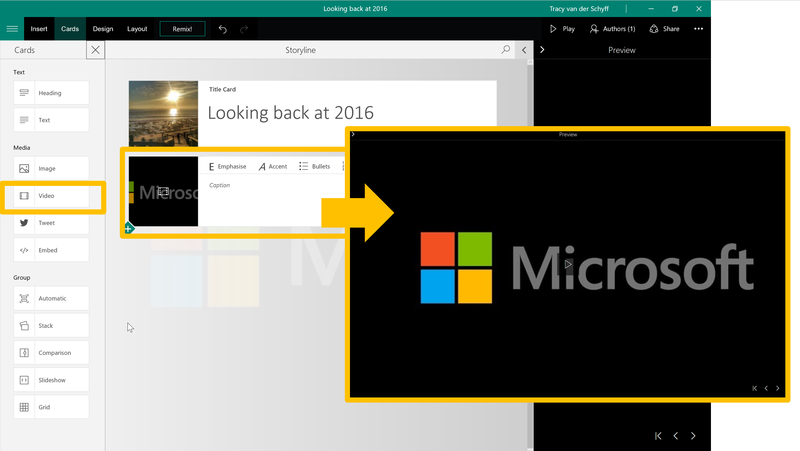 In my previous post I covered all the basics and possibilities when it comes to inserting images on your Sway. At first I really struggled to upload a video (drag it onto the card from my local pc). Then as we do, I read this blog on the Microsoft Community site and found a comment from someone who got it working if they do it through their OneDrive – which I did – Voila!! Something interesting happened though while adding my Tweets. I got a message regarding maximum number of Tweets and clicked on the Read More link to find out more. According to this article there are limitations on cards you can add. The difference between Free and Office 365 is rather large. As you’ll remember I signed in with my Windows Live ID to be able to share this Sway with people outside of my organization. 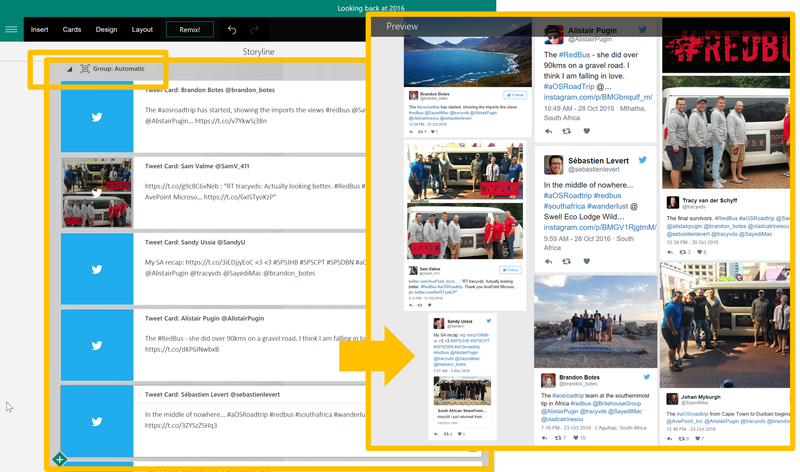 See Sway content limits — free vs. Office 365. For this example I used Googlemaps, Soundcloud and Youtube. 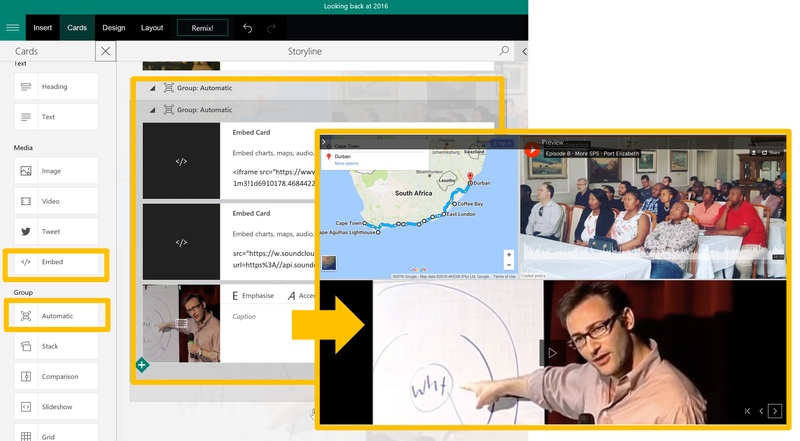 I wanted to insert the map of the route we travelled for the #RedBus #aOSRoadtrip in August, a video of Simon Sinek as well as the Pocast by 2GuysAndSharePoint. We’ve now covered all the cards. Tomorrow we’ll start putting the content together and look at the design and layout options.